Dawn's Early Light is a stiking example of Rod Chase's ability to make a simple monument so very elegant. 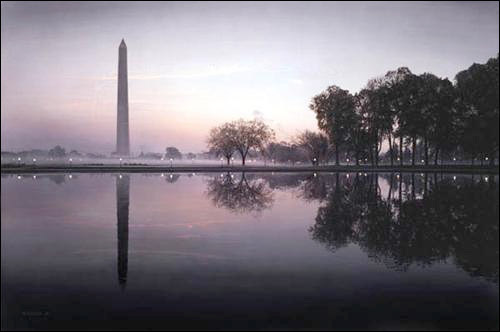 Inspired by the photography of F. Maroon, Chase spent days researching and photographing the Washington Monument. This 555-foot-tall obelisk, built at intervals between 1848 and 1885, memorializes George Washington's loyalty and devotion to principle and country. Dawn's Early Light is the eighth painting in Rod Chase's Foundations of Freedom series. Dawn's Early Light copyright© 2005 by Rod Chase is prohibited from being copied. 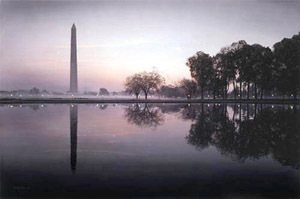 Rod Chase art, Foundations of Freedom series, Washington Monument, Washington DC, historical landmarks, patriotic, Americana, artwork, art work, canvases, images, paintings, pictures, and prints of Dawn's Early Light by artist Rod Chase for sale. Dawn's Early Light painting by artist Rod Chase can be purchased in art print or canvas form at special sale prices at Christ-Centered Art.